The Bookstore is owned and operated by Northeastern A&M College to provide textbooks and related instructional supplies. Its diverse selection of books, collegiate clothing and supplies reflects the wide variety of backgrounds and interests that make the College a world-class institution. The bookstore is located in the Bruce G. Carter Student Union and is open 7:45 am to 4:00 pm, Monday through Friday. 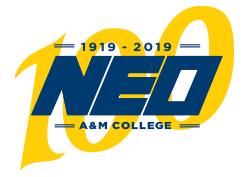 The NEO A&M Bookstore is where you will also find all of your NEO Gear. We carry several different clothing brands such as The Game and Champion to name a few. We carry infant to adult, you are sure to find something for everyone. We also have supplies for game day, house flags and drinkware. So stop in and check it out.